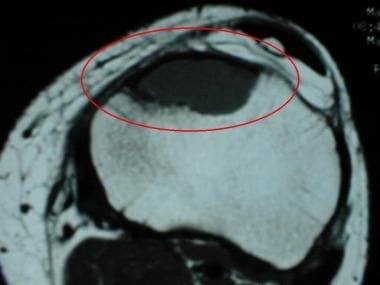 The tumor arises from the cartilage-forming connective tissue of the marrow space. As its name implies, this benign cartilaginous neoplasm consists of chondroid, myxoid, and fibrous tissue in variable amounts, and microscopic evaluation of a wide area of the tumor may be necessary to identify all of the tissue subtypes. The radiographic characteristics of CMF are depicted in the images below. Radiograph of the proximal tibia of a 16-year-old boy reveals a large, lucent, slightly expansile, eccentric metaphyseal lesion with thin, sclerotic borders. Pathologic analysis helped confirm a diagnosis of chondromyxoid fibroma. Anteroposterior radiograph of the distal femur of a 14-year-old girl reveals a large, expansile, bubbly, eccentric metadiaphyseal lesion. Pathologic analysis helped confirm a diagnosis of chondromyxoid fibroma. Osteoclast-like giant cells may also be present, as may small cysts and hemorrhagic zones. Focal calcification is found microscopically in approximately one fourth of patients, although any gross evidence of calcification is rare. Most CMFs (75%) occur in the bones of the lower extremity, particularly around the knee joint. CMF is localized to the femur and tibia (as seen in the images below) in 50% of patients. The most common site is the proximal tibia, which accounts for approximately 30% of cases. 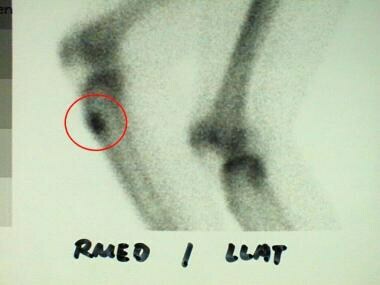 The humerus, radius, and ulna also are affected, although reported percentages vary widely from study to study because of the rarity of the lesion. Lateral radiograph of the distal femur of a 14-year-old girl. 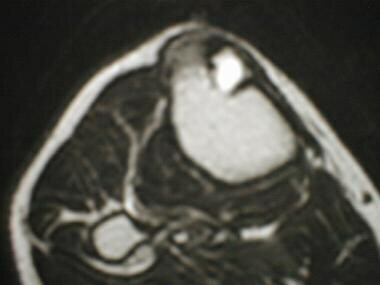 A large, expansile chondromyxoid fibroma is seen. 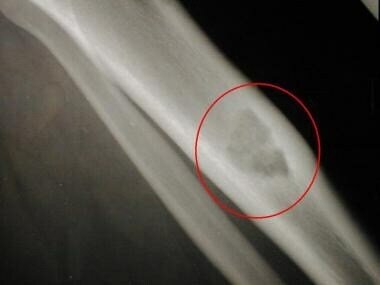 Anteroposterior radiograph of the proximal tibia of a 36-year-old man reveals a well-defined, lucent lesion in the metadiaphysis with sclerotic margins. 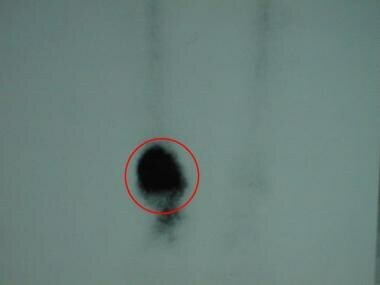 Pathologic analysis helped confirm a diagnosis of chondromyxoid fibroma. T1-weighted coronal MR image of the sacroiliac joints in a 20-year-old woman reveals a chondromyxoid fibroma with low signal intensity in the right ilium. Within the bone, the tumor typically originates in the metaphysis close to the physis. The tumor may extend into the epiphysis, the diaphysis, or both. Apophyses also may be affected (eg, the greater trochanter of the femur). 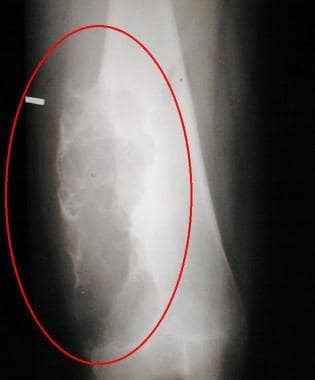 In the long bones, the tumor is usually eccentric and ovoid in shape (as seen in the image below), with the long axis paralleling the length of the bone. In smaller bones, the tumor may occupy the entire volume of bone. Lateral radiograph of the tibia of a 36-year-old man. 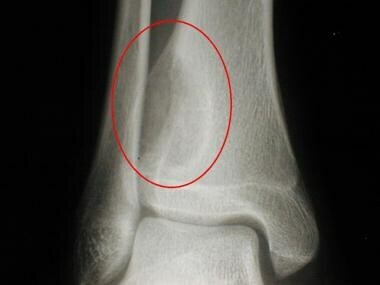 A chondromyxoid fibroma is situated anteriorly within the tibia along the cortex. CT scan of the distal tibia of a 16-year-old boy reveals calcific matrix in a chondromyxoid fibroma. 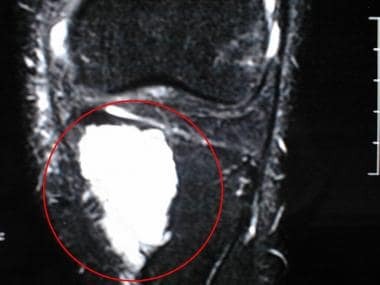 Fat-suppressed T2-weighted coronal MR image of the knee of a 37-year-old man. High signal intensity in the medial aspect of the proximal tibia corresponds to the location of the chondromyxoid fibroma in this patient. Although findings on conventional radiographs may suggest the diagnosis of CMF, definitive diagnosis requires an analysis of biopsy specimens. On conventional radiographs, such as the 2 images below, a CMF usually appears as a well-marginated, expansile, eccentric, lucent medullary lesion in the metaphysis of a long bone, ranging in length from 3-10 cm. Radiograph of the distal tibia of a 16-year-old boy reveals a lucent, eccentric metaphyseal lesion with a thin, sclerotic margin. Pathologic analysis helped confirm a diagnosis of chondromyxoid fibroma. The tumor may extend into the diaphysis (see the first image below) or, uncommonly, into the epiphysis (see the second and third images below). CMF may rarely be purely diaphyseal (see the fourth image below), but it is never solely epiphyseal. The tumor may replace the bulk of a smaller bone. Smaller CMFs may appear to arise from the cortex of bone, and juxtacortical (exophytic) tumors have been reported. Chondromyxoid fibroma. Radiograph of the proximal tibia of a 37-year-old man shows a small, lucent, eccentric metaphyseal lesion with a thin, sclerotic margin. No intervention or additional imaging was performed at the time. Radiograph of the proximal tibia obtained 5 years after the radiograph in the previous image was obtained. The lucent metaphyseal lesion has grown and currently extends into the proximal tibial epiphysis. Pathologic analysis helped confirm a diagnosis of chondromyxoid fibroma. Radiograph of the tibia of a 15-year-old girl reveals a lucent, slightly expansile diaphyseal lesion. Pathologic analysis helped confirm a diagnosis of chondromyxoid fibroma. 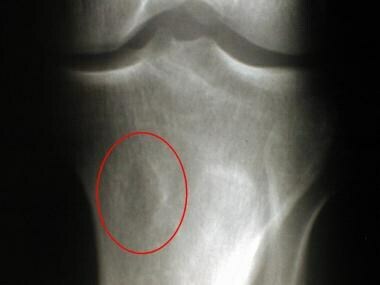 Smaller tumors are usually round with a thin, sclerotic margin (as in the image below) and uncommonly contain visible calcification or trabeculation. 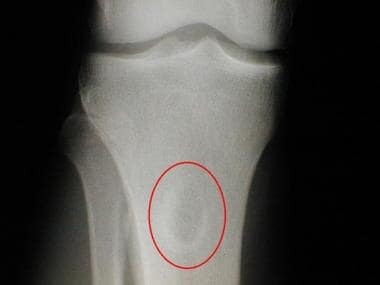 In larger lesions, remnants of cortical bone reinforcing the tumor at the periphery can appear on radiographs as trabeculation. These osseous ridges along the periphery are also responsible for the bubbly, cystic radiographic appearance of CMF (see the first 2 images below). A sclerotic, scalloped border is typical. Compared with other cartilaginous tumors, the matrix of CMF uncommonly appears calcified on conventional radiographs. 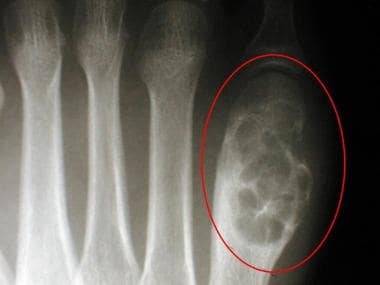 Radiograph of the first metatarsal of a 16-year-old boy reveals a bubbly, expansile, lytic lesion in the distal metadiaphysis. Pathologic analysis helped confirm a diagnosis of chondromyxoid fibroma. Radiograph of the right sacroiliac joint of a 20-year-old woman reveals a bubbly, lucent lesion of the medial right ilium with sclerotic margins. Pathologic analysis helped confirm a diagnosis of chondromyxoid fibroma. 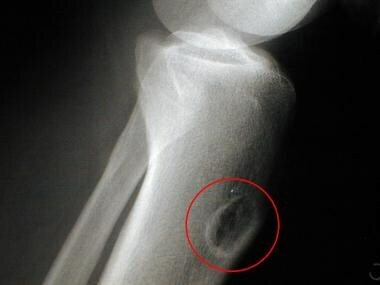 An eccentric, medullary, bubbly-appearing, metaphyseal lesion with scalloped, sclerotic borders should prompt the radiologist to consider CMF in the differential diagnosis, particularly if the lesion is found in the proximal tibia. However, diagnosing CMF with a high degree of confidence by using imaging studies may be difficult because of the rarity of the tumor. An analysis of a biopsy specimen is always necessary for a definitive diagnosis. CT scan of the legs of a 15-year-old girl reveals replacement of the normal fatty marrow by a chondromyxoid fibroma. Trabeculation is evident. 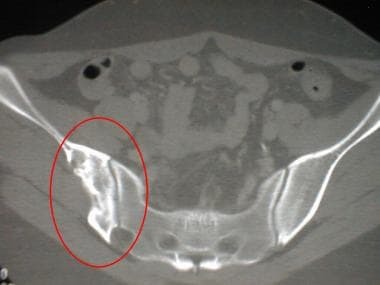 CT scan of the pelvis of a 20-year-old woman reveals a right iliac chondromyxoid fibroma. Trabeculation is evident. CT scanning is the best imaging modality for detecting sclerotic margins and ridges and matrix mineralization, and CT findings can depict the cortical integrity of the lesion. CT scans may show calcification within the tumor that is not visible on conventional radiographs. CT findings may reveal calcifications within the lesion that are not apparent on conventional radiographs; therefore, CT findings may increase the suspicion that a lesion is cartilaginous. Otherwise, CT scans add little to the diagnosis. MRI findings of CMF are nonspecific. The tumor typically demonstrates low signal intensity on T1-weighted images (as in the first 3 images below) and heterogeneous, high signal intensity on T2-weighted images (as in the fourth image below). T1-weighted transverse MR image of the proximal tibia of a 37-year-old man. The eccentric lesion with low signal intensity situated in the anterior tibia corresponds to the location of the chondromyxoid fibroma in this patient. T1-weighted transverse MR image of the proximal tibia of a 36-year-old man reveals a chondromyxoid fibroma with low signal intensity. 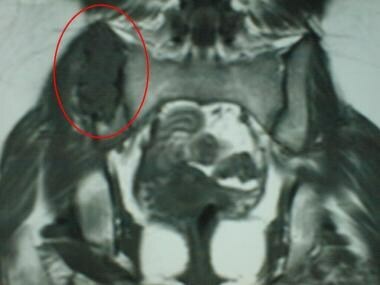 T2-weighted transverse MR image of the pelvis of a 20-year-old woman. A right iliac chondromyxoid fibroma demonstrates heterogeneous high signal intensity. 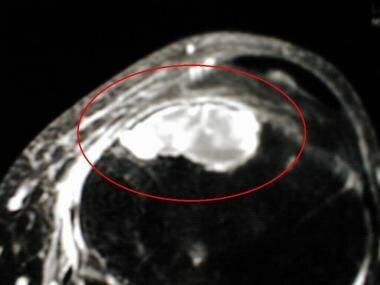 Smaller lesions, as well as some larger lesions, may demonstrate a homogeneously bright signal on T2-weighted images, often with a hypointense rim (see the first image below). 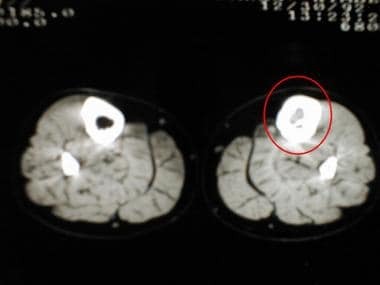 Enhancement following intravenous administration of gadolinium is typically heterogeneous (see the second image below), often most prominent along the vascular borders of the tumor. Heterogeneity is believed to be the result of varying amounts of chondroid, myxoid, and fibrous tissues in the tumor, as well as any underlying cystic and/or hemorrhagic components. T2-weighted transverse MR image of the tibia of a 36-year-old man reveals a chondromyxoid fibroma with high signal intensity. 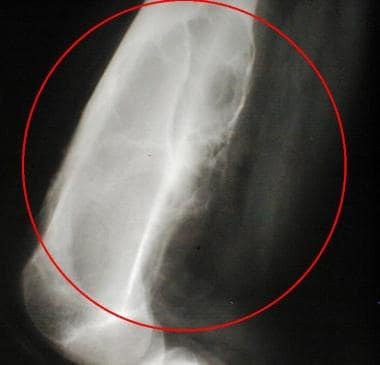 Fat-saturated T1-weighted transverse MR image of the proximal tibia of a 37-year-old man obtained after the intravenous administration of gadolinium. The chondromyxoid fibroma is heterogeneously enhancing. MRI findings of CMF are nonspecific and typically do not alter the degree of confidence in the diagnosis. The primary role of MRI is in preoperative planning (ie, evaluation of the extent of the tumor). 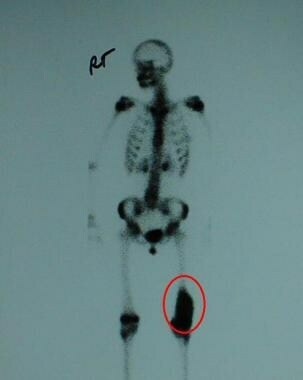 Although increased radionuclide activity is demonstrated in CMFs on bone scans (as in the image below), nuclear medicine procedures are of limited use in the diagnosis or management of these lesions. 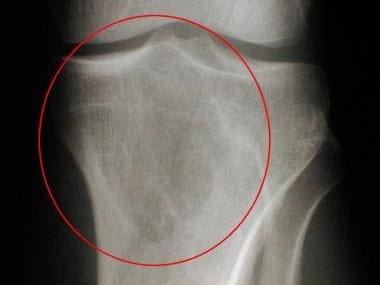 Delayed bone scan image reveals increased activity in the distal right tibia, corresponding to a chondromyxoid fibroma. 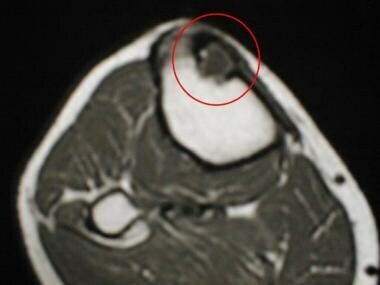 The typically eccentric location of a CMF may be evident if the lesion is relatively small (see the first image below). Smaller lesions may be subtle if located adjacent to a growing physis or joint that typically accumulates radiotracer (eg, the sacroiliac joint) (see the second image below). Delayed bone scan image of a 36-year-old man reveals increased activity in the anterior aspect of the proximal tibia, corresponding to a chondromyxoid fibroma in this patient. 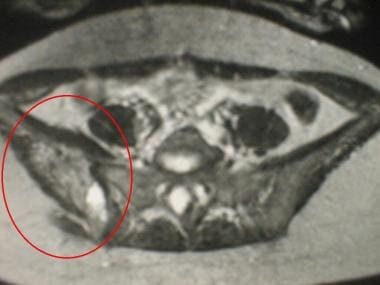 Delayed bone scan image of the pelvis (posterior view) of a 20-year-old woman. 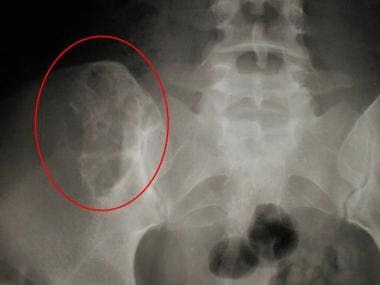 Activity at the right sacroiliac joint is slightly increased, corresponding to a chondromyxoid fibroma in this patient. Increased flow may be apparent on the angiographic portion of a 3-phase study (see the first image below). 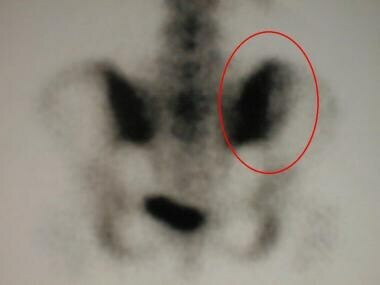 Bone scintigraphy may be used to exclude the possibility of multiple lesions, which are highly uncharacteristic of CMF (see the second image below). Angiographic phase images from a bone scan of a 16-year-old boy reveal increased flow to the site of the chondromyxoid fibroma in the distal right tibia. 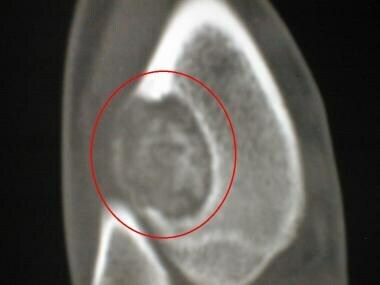 Delayed bone scan image of a 14-year-old girl. 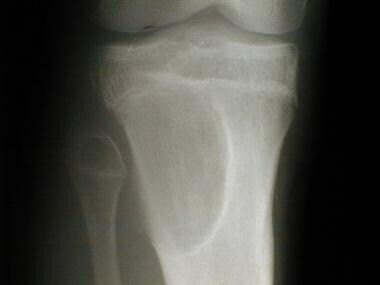 Activity in the distal left femur is increased at the site of a chondromyxoid fibroma. No additional sites of abnormal uptake are seen. Nuclear medicine studies add little to the degree of confidence in the diagnosis, although finding multiple lesions on a bone scan is highly uncharacteristic in CMF. Angiography is of limited use in the diagnosis of CMF. Angiographic appearances are nonspecific, with the tumor demonstrating either minimal neovascularity or no internal vascularity, with or without surrounding vascular tissue. Angiography may be used to define surrounding vasculature or for planning embolization (uncommon). Angiography typically does not alter the degree of confidence in the diagnosis, but it may be used as a preoperative study. Jaffe HL, Lichtenstein L. Chondromyxoid fibroma of bone: A distinctive benign tumor likely to be mistaken especially for chondrosarcoma. Arch Pathol. 1948. 45:541. Lersundi A, Mankin HJ, Mourikis A. Chondromyxoid fibroma: a rarely encountered and puzzling tumor. Clin Orthop Relat Res. 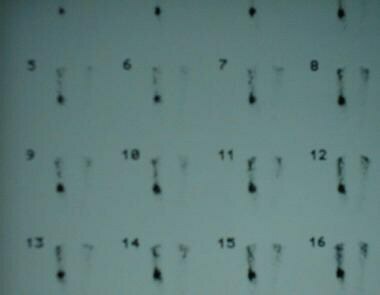 2005 Oct. 439:171-5. Budny AM, Ismail A, Osher L. Chondromyxoid fibroma. J Foot Ankle Surg. 2008 Mar-Apr. 47(2):153-9. [Medline]. Veras EF, Santamaria IB, Luna MA. Sinonasal chondromyxoid fibroma. Ann Diagn Pathol. 2009 Feb. 13(1):41-6. [Medline]. Oh N, Khorsandi AS, Scherl S, Wang B, Wenig BM, Manolidis S, et al. Chondromyxoid fibroma of the mastoid portion of the temporal bone: MRI and PET/CT findings and their correlation with histology. Ear Nose Throat J. 2013 Apr-May. 92(4-5):201-3. [Medline]. Jadhav AB, Tadinada A, Rengasamy K, Fellows D, Lurie AG. Clival lesion incidentally discovered on cone-beam computed tomography: A case report and review of the literature. Imaging Sci Dent. 2014 Jun. 44(2):165-9. [Medline]. [Full Text]. Yalniz E, Alicioglu B, Yalcin O, Yilmaz B. Non specific magnetic resonance features of chondromyxoid fibroma of the iliac bone. J BUON. 2007 Jul-Sep. 12(3):407-9. [Medline]. Scout image from a CT examination of the legs of a 15-year-old girl reveals a lucent diaphyseal lesion with sclerotic margins; this lesion represents a chondromyxoid fibroma in this patient.